You’ve got to admire the Germans — when life hands them lemons, they make lemonade. Or, in this particular, case, it hands them Merkel Legos and they make Merkel Chairs. German pedestrians no longer have to suffer the presence of those ugly concrete bollards — a.k.a. 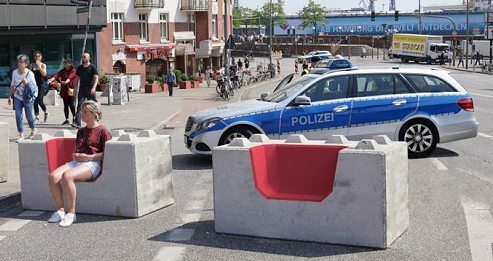 “jihad barriers”, “Koran blocks”, or “Merkel Legos” — they can sit on them instead! Not Satire — Mario Pitsch and his business partner Oliver Schau, from Chemnitz, have converted concrete barriers that are intended to protect busy squares into imaginative seating furniture, and won the German Design Award for it. The barriers, which originally had a bad image, are brilliantly changed into brightly-colored street furniture. The color red is practical: you will not see the blood so well! This entry was posted in Counterjihad, Domestic terrorism, Enrichment, Europe, Humor, Immigration, Insanity, News, PC/MC, Politics, Stupidity, Treason by Baron Bodissey. Bookmark the permalink. We used to be a land of walled villages and towns. Many cities even had multiple walled towns within the walled city. Many history enthusiasts are upset that in the enlightement era, our rulers ruled to get rid of the city walls, because modern artillery made city walls irrelevant. Who says the Germans have no sense of humour? That is a large amount of concrete removed. Is there enough mass remaining to stop a truck? Obviously, that is not a concern to the government or they would have outlawed such a practice. Perhaps as is the case with most forms of government supposed security, these blocks are now simply ‘window dressing’. The people ‘feel’ safe and that is all that matters I guess. It may or may not be enough to stop a truck, it certainly isn’t enough to stop a knife. A halfway intelligent jihadi will just use those natural choke points to his advantage and a knifing or bombing on the inside of those anti-vehicle barriers could be used to deliberately provoke a stampede which depending on the numbers involved could hurt or kill many more. Or the same event could be used to funnel infidels to the natural choke points between the Merkel Legos where they could be targeted as they leave by guns or even vehicles due to their concentrations. If the leaders had the capacity or desire to consider second or third level effects, they would not have permitted Muslim immigration into their country in the first place. I don’t see evil and stupid as incompatible. The leaders like Merkel are without doubt evil narcissists. The full-blown narcissist enjoys making other people suffer for no reason, simply to assert his own ability to cause them to suffer. Remember the video of Merkel in the 90’s in a bathing suit twisting and wreathing her grotesque body? As for being stupid, if these people had any idea about real science, they would not be able to act as stupid as they act. I’m not saying they wouldn’t make the attempt, but I don’t think you can feign that depth of ignorance and stupidity unless there is real stupidity behind it. Love it. I’ll quote that if you don’t mind. What happens when Killer Ali drives his 40-Tonner into the block when a young mother sits there breastfeeding her hungry child?